Ichinomiya (一宮市) is a city in Aichi - after expansion in 2005 to include nearby Bisai and Kisogawa, it is the 4th largest city in the prefecture. Ichinomiya is historically a center for woolen textiles, and many aspects of textile production still flourish in the city, such as world-famous yarn manufacturer Eisaku Noro. Ichinomiya is roughly halfway between Nagoya and Gifu. By rail, take the JR Tokaido line from Nagoya to Owari-Ichinomiya (9 mins, 290Yen), or the Meitetsu Nagoya or Bisai lines. By road, Ichinomiya is accessible from the Toumei, Meishin, and Tokai-Hokoriku expressways. Masumida Shrine - Ichinomiya means 'first shrine' (in the sense of most important) and Masumida was the principal shrine of Owari Province (now Aichi). The ornate shrine is surrounded by pleasant grounds, including a pool with carp and turtles, which are a pleasant place to stroll on a summer day. The main gate was recently refurbished, to restore the carving and gilding. Masumida plays host to most of the town's festivals, including New Year celebrations, the Tanabata festival in late July, and an annual craft fair. 138 tower park - 'Ichino-mi-ya' can be read as the number '138', and so the number crops up regularly in the local area. 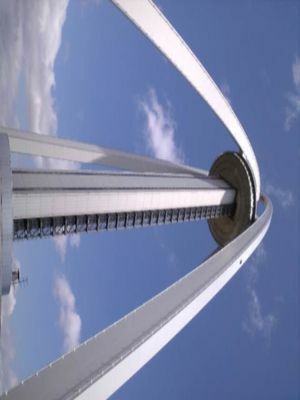 Ichinomiya Twin Arch 138 is the tallest arch-style tower in Asia, at (you guessed it) 138m tall. An observation platform at 100m (admission 500Y for adults) gives a panoramic view of the Kiso Valley. One sight of note is the nearby village which is constructed entirely on an island in the middle of the Kiso River. The tower is surrounded by parkland, which is especially pleasant during cherry-blossom season. The park is easily accessible by bus from Ichinomiya station. 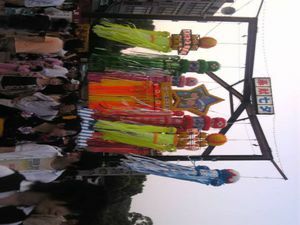 Tanabata Matsuri - Held from Thursday to Sunday of the last weekend in July, this is reputed to be one of the three biggest Tanabata festivals in Japan, and attracts up to 1.3 million visitors annually. The streets are strikingly decorated and bustling with festival-goers in yukata, centering around Masumida Shrine, and the festivities include a parade to dedicate local products to the shrine, bon-dancing - which anyone is welcome to join in, live music of all kinds, and the usual summer festival stalls and attractions. Bisai fireworks festival - held in August as part of Bisai summer festival, some 5000 fireworks (including some with blooms of up to 500m) are released on the banks of the Kiso river. If you can't get a spot at the site, a popular and convenient place to see the show is from the rooftop carpark of Diamond City Kirio mall (10 mins walk from JR Kisogawa). May or early June (this year, May 11th 2008) see a large craft fair based around Masumida, with over 100 stalls selling handcrafted articles and craft materials, plus food, live music, and hands-on workshops where you can try various crafts such as leatherwork, spinning, weaving and dyeing. Accomodation is mostly in the form of business hotels, and several chains (Toyoko Inn, Route-Inn, City Hotel, Green Hotel) have branches near the station. This page was last edited on 7 February 2019, at 08:57.